If you hear "Museum of Film", you probably think of collections of costumes, 1950ies Hollywood posters and old cameras. The "Österreichisches Filmmuseum" or Austrian Museum of Film in Vienna is nothing like that at all. In fact, it is a museum with an extensive collection that consists exclusively of films and film fragments. It was founded by Peter Konlechner and Peter Kubelka in 1964, both gentlemen are still curators of the museum. One of them happens to be a friend of a former teacher of mine, which is why I had the honour of attending a private presentation of the museum in the late 1990ies. The museum is dedicated to the collection, conservation and appropriate presentation of films. The film museum is situated underneath the Albertina, in the part of the Hofburg that was once part of a bastion and the Augustine monastery. Here, it has a cinema with the right projectors for authentic screenings. In daily life, the film museum works similarly to an art cinema, with viewings of rare films. Behind the scenes, it occupies historians, conservationists and curators. The "regular" program runs from October to May with supplemental screenings throughout the year. 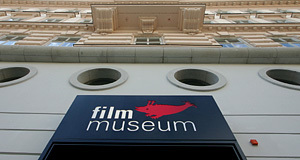 The logo of the Austrian Museum of Film is a very characteristic Renaissance drawing of a whale. The museum highlights Austria′s important role in the development of early film. If you are into historic films, you might associate France with the development of film. This was in the later 19th century - a period when Vienna was pretty big in most technical developments, playing in the same league was Paris, London and New York. Those days are long gone, but bits and pieces of very early films recall the spirit of progress and modernism, in which young Austrian filmmakers pushed the development of this new medium forward. Up to the 1930ies, Austria had an internationally acclaimed film industry. Afterwards - like other "intellectual" things - the film making world went downhill and now all that is left are Billy Wilder and Arnold Schwarzenegger. At least the Oscar for the best non-English film went to Austria in 2008. The Film Museum plays an internationally important role as an archive and a library and marks a focal point for Vienna′s cinema aficionados. In addition to the main venue at the Albertina, there is a second place in Heiligenstadt, in the 19th district. The Film Museum is a member of the Federation Internationales des Archives du Film, an international association of film archives. Nearby attractions include the previously mentioned Albertina, the Augustine Church, the National Library and other attractions of the Hofburg; the Michaelerplatz, the Theatre Museum at Palais Lobkowitz; the Staatsoper or National Opera; the Hoher Markt Square; and the Ringstraße.